2018 is a going to be an exciting year in the history of Sweden Rock Festival, with large bands and massive stage productions. Since we are also increasing our capacity from 33 000 sold tickets per day to 35 000, we have spent alot of time and resourses to make sure that we are offering our visitors a really great festival experience, with extra focus on safety and security. And even though most things on the festival area will look the same as last year, below we would like to explain some of the upgrades and news for 2018. - This year we are upgrading the sound for Festival Stage by introducing a dealy system, mounted onto two towers on each side of the main bar. The delay system will result in better sound quality, more equally spread over the audience area. - On the delay towers, we will add two new and screens showing the concersts and artists up close. - In order to increase audience safety, and as a respons to requests from some of the bands, we will divide the audience area in front of Festival Stage into different zones. All visitors will have access to all zones of course, but the idea is that the divisions will reduce the risk of uncontrolled audience movements during the concerts. 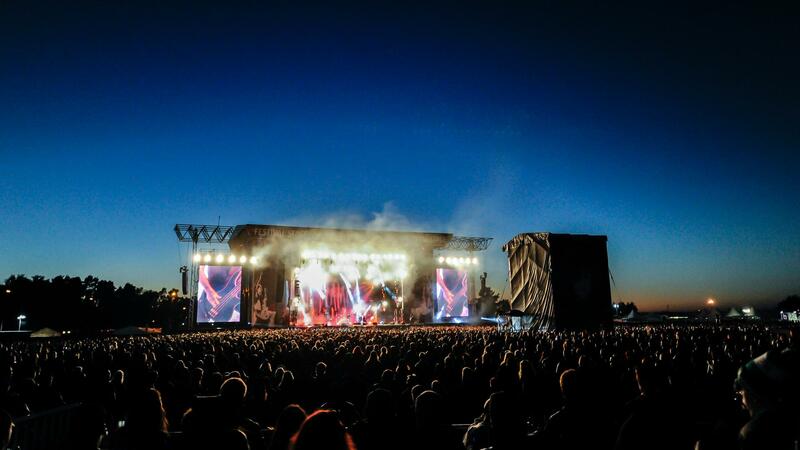 - Rock Stage is upgraded to a whole new and larger stage, enabeling larger productions and more technology. - The white, rectangular tent that has formerly surrounded Rockklassiker Stage will this year be exchanged for a new, oval tent. The purpose is that there will be less daylight inside, allowing the bands playing that stage to use more lighting and special effects. - Due to the increased number of visitors, we are also increasing the number of personell in our bars, to ensure continuous great service and minimal lines. - In addition, the bars will get a "make-over", and will be given individual themes based on our new brands Falcon, Staropramen and Brooklyn. The bar to the left of the main entrance will even get a sun deck, and we are adding a whole new bar in the food court area. More information about the bars will come shortly! - The number of lavatories are increased even further this year. In order to make sure that they are utilized as effeciently as possible - and to keep them as clean as possible - we are centralizing the lavatories in to two main areas. One will be located behind the 4Sound area (where it has been for numerous years), and the other will be found between Festival Stage and the VIP area. - The public platform that was introduced last year will return, as well as the disability ramp. - In order to make sure that you can exchange your ticket into a festival wristband as fast as possible, we are changing the ticket-exchange area a bit. Already at the entrance, you will be met by personell that will check your ticket and show you which corral to use. Inside the corral your ticket will be scanned and you will recieve your wristband. More details about the ticket exchange will come shortly! Eventually, we would like to tell you about some of the security improvements we are making this year. Already last year we upgraded the security in a number of ways. And in the light of the increased number of visitors this year, we are continuing this process, in close cooperation with the police, making a number of further additions. - To allow for careful searching and in order to minimize lines, we are opening up a new and large entrance right across from the Sweden Rock Shop. This new entrance can be used regardless of which type of wristband you have. - Simultaneously, we are closing the smaller north entrance, which now will only be used as an exit if there is a need for an evacuation. The reason being that we have received recurrent comments and concearns about this entrance from the band's own security organizations. We are well aware that this will mean a bit longer of a walk for visitors staying north of the festival area, but the decision is precedid by careful analysis and we hope that you can appreciate that we are doing it out of consideration for your safety. - One of the improvements the closing of the north entrance will imply, is that pedestrians and vehicles will be separated. The same will be done for the area around Sweden Rock Shop, and instead we will build a welcoming portal and improve the access to the information booth in this area. - All pedestrians coming from the north side will be referred to walking on the west side of road 508. In other words, it will not be possible to walk along the festival fence any longer. In order to cross road 508, for your own safety we ask you to use the tunnel, which by the way will receice new lighting and paint. - As a result of the no-vehicle zone, the taxi stand is moved to the west side of road 508, and to catch a taxi you will need to use the tunnel as well. - Finally, since we know that lighting is important to safety, we are adding in total ten new lighting masts to the festival area.